My felting has continued to evolve. This is the largest of my projects to date. The outer layers of the sculptures are felted with a single needle into a layer of foam which is covering wire armatures - an 8 month journey. The largest piece stands 6 feet tall and the entire installation is about 15 feet long. This soft world centers around global warming and the ice rapidly melting in the Arctic. It's based on a myth of my creation involving the giant Cranch Squid and a tribe of Inuit. My story takes you to the crossroads of disaster. The entire tribe of the Antarctic Inuit would gather once a week and tell stories of adventure, misfortune and discovery. 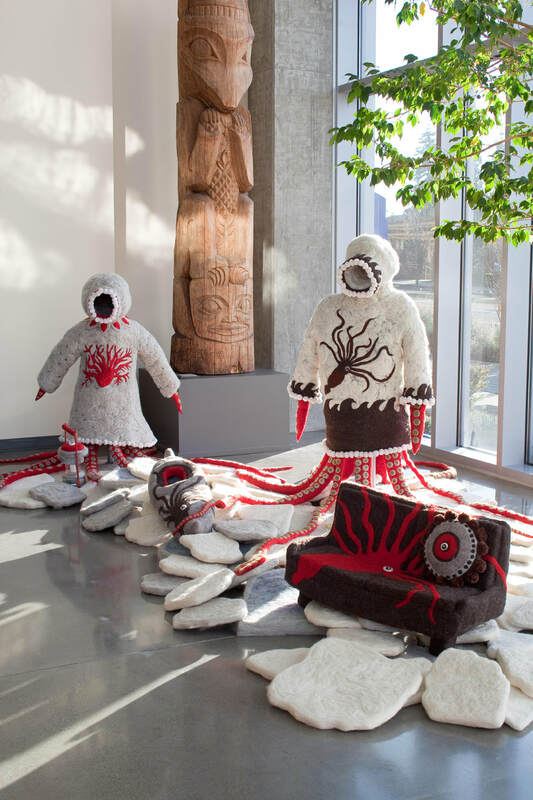 One Inuit in particular named Aguta told a story of the colossal squid and the mystery that shrouded them. Aguta would sit everyone down and speak in a whisper. Everyone was very quiet and listened intently. Where the wind swirled horizontal and the sky was dark with clouds, that is where you will find the melting ice islands. Many centuries ago a group of these colossal squid left the water and moved onto the land. Now the squid slither on the slick ice to accomplish tasks of survival. The Inuit developed a deep respect for these immense creatures and began to work alongside them. The squid would fish with their impossibly long tentacles and the Inuit would exchange fish for warm winter coats with deep hoods. The squid were very light sensitive from living in the darkest depths of the ocean, so these coats were a necessity. This relationship continued for many years until one day the ice islands began to melt. All the possessions of squid and Inuit alike began to sink into the sea. The Colossal squid would be forced to return to the ocean and rescue the Inuit tribe. At least fifty Inuit could fit on one squid. They used leather laces, held on tight and boarded the squid returning to the sea. Every now and then you will see them pass by; luminescent, skimming the top of the water. You will hear them coming with a plick, plick, plick sound just before they plunge back into the sea.